After a several decades-long collaboration dedicated to preserving the sites and artifacts related to Pulitzer Prize winning author, Willa Cather, History Nebraska and the Willa Cather Foundation are pleased to announce the transfer of ownership of the Willa Cather State Historic Site to the Willa Cather Foundation. Located in Red Cloud, Nebraska—where Cather spent her formative years—six historic properties and supporting collections will be transferred to the Willa Cather Foundation on January 24, 2019. The properties were given to the State of Nebraska in 1978, and History Nebraska has worked cooperatively with the Willa Cather Foundation to operate the site since 1994. The transfer of the historic sites and approximately 8,000 Cather related archival and museum artifacts, returns to local control the largest single collection of buildings devoted to an American author. Trevor Jones, Director and CEO of History Nebraska, says the transfer will help strengthen Cather’s legacy in Nebraska: “We are honored to have cared for these important properties for the last forty years. The Willa Cather Foundation is an excellent organization and by fully controlling this important historic site Willa Cather’s legacy will be shared more extensively nationwide.” The transfer supports the mission of the Willa Cather Foundation and will help ensure that the newly completed National Willa Cather Center will remain a primary location to learn about and research one of America's most iconic writers. Tourists and scholars from around the world visit Red Cloud because of its associations with Willa Cather. In addition to overseeing a growing archive of Cather letters and photographs, the addition of the Willa Cather Pioneer Memorial Collection will make the National Willa Cather Center the largest repository for Cather-related artifacts. Included in the artifacts are tangible items that belonged to the Cather family, as well as furnishings, family book collections, and other possessions. 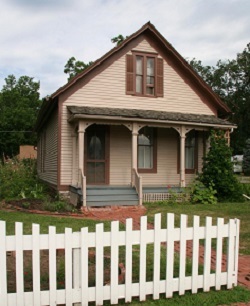 Willa Cather’s Childhood Home, a National Historic Landmark, was the rented home to the Cather family after 1884 when they moved into town from an outlying farm. It is especially beloved because of Cather’s preserved bedroom under the eaves where she did her first writing and where the wallpaper that she selected and purchased still remains. The Ántonia Farmhouse (the Pavelka Farmstead), about 15 miles north of Red Cloud. Anna Pavelka was the inspiration for the novel My Ántonia, published in 1918. Cather had visited the Pavelkas there in 1916 and the last section of the novel is a description of the farm and its cellar, also still on the farm site. The Farmers and Merchants Bank was built by Silas Garber, Red Cloud’s first citizen who incorporated the town in 1871. He was a prototype for Captain Forrester in Cather’s novel, A Lost Lady. The Grace Episcopal Church, which Cather joined in 1922 and was a member until her death. Two of the church’s painted glass windows were purchased by Cather in her parents’ memory. The St. Juliana Falconieri Catholic Church, built in 1883, is the site of the marriage of Anna Sadilek Pavelka and her husband John Pavelka, prototypes for Ántonia Shimerda and Anton Cuzak. The Burlington Depot, a building Cather became familiar with when returning to Red Cloud to visit friends and family. Depots in general played a significant role in Cather’s writings, symbolizing both escape to the world and the door through which the world came to Red Cloud.